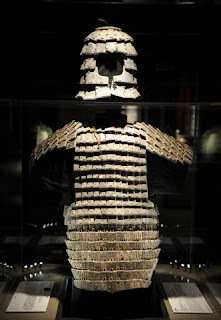 The early Han armor are almost identical to the armor of the late Warring States era, as the centuries progressed, and new threats arose, the armor of the fighting men became both more flexible while also covered more parts of the body. 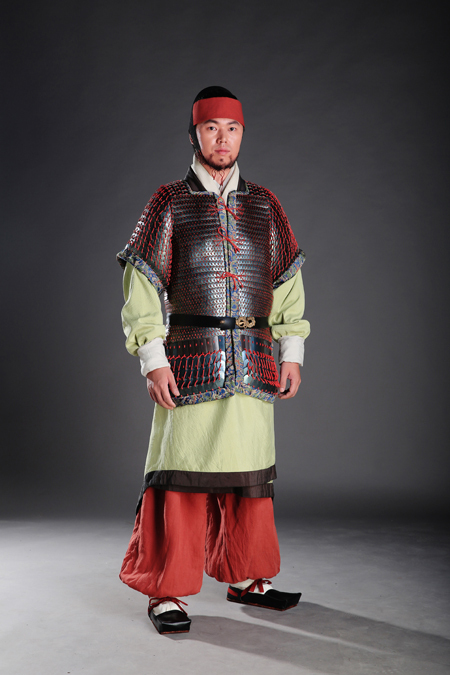 The Han also witnessed some of the first true cavalry armor in Chinese history. In time, the Han would have to stand up for itself to face the new threats from the west. 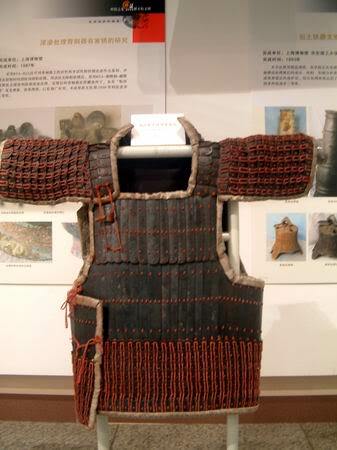 During the Warring States era, most armour was made of leather or bronze (occasionally iron), or a combination of both. 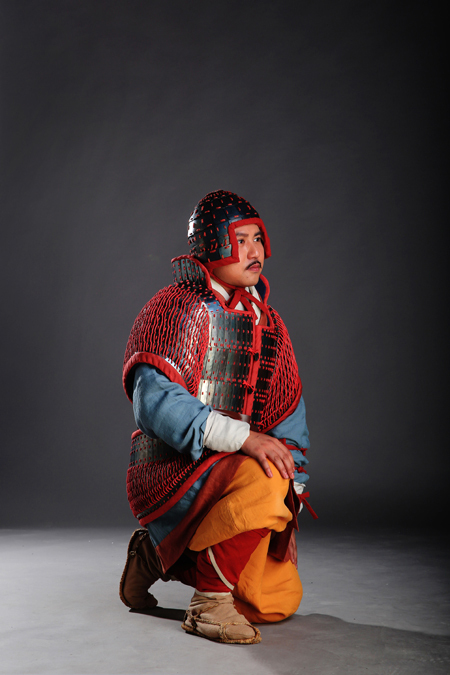 The metal that was used most for military purposes was bronze. Cast iron began to appear in the 5th century BC, but did not begin to replace bronze until the 2nd century BC. 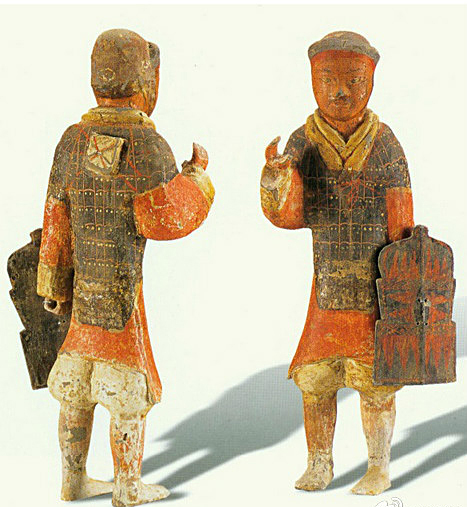 The early Han infantry would be almost identical to the Terracotta Warriors, this one especially wore a rather elaborate coat of plate, where hundreds of metal caps are fitted over a flexible coat of hardened leather. The general construction of this kind of armor would diverge into primitive lamellar armor, and also scale armor with many overlapping scales. 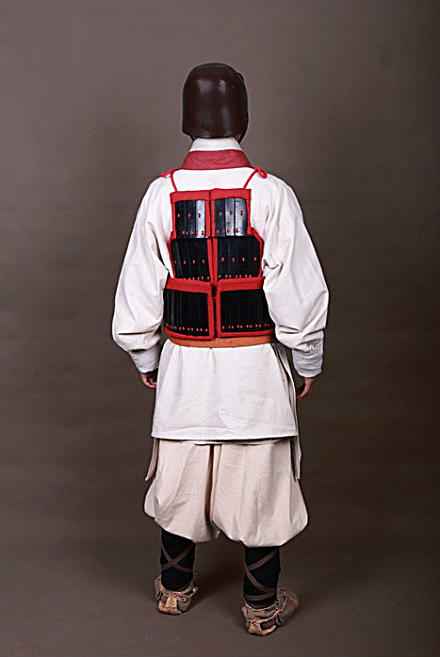 Most infantrymen wore lamellar or coat of plates cuirasses. The lamellar cuirass worn by these men was made of hundreds of small overlapping metal and/or leather plates laced together to make a flexible and light coat of armour. 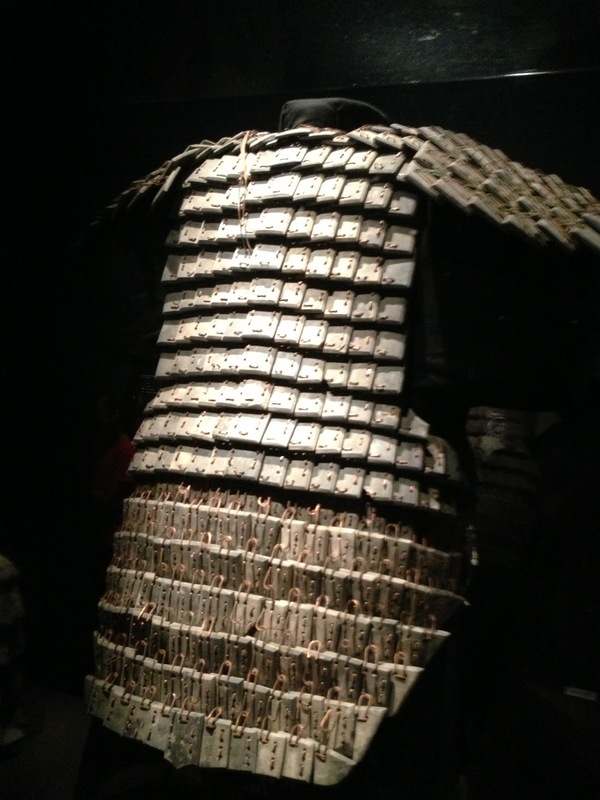 Coat of plates consisted of hundreds of small non-overlapping metal or leather plates stitched or riveted together. 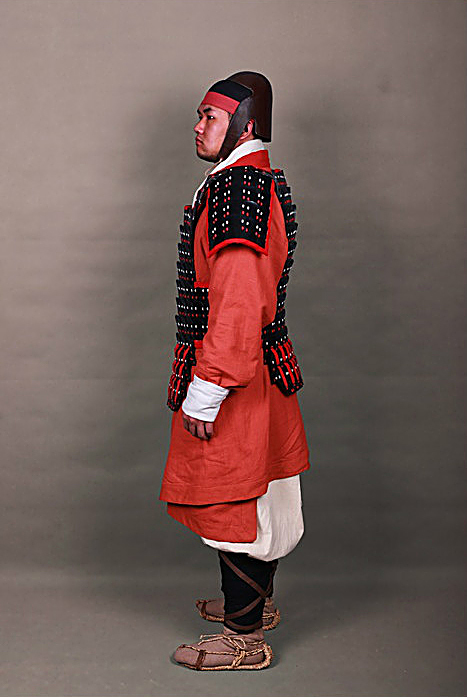 Shoulder guards and helmets were often used, but leather caps seem to have been more common for ground infantry. Until middle of Han period, there seemed to be a general lack of helmets for the massed infantry. 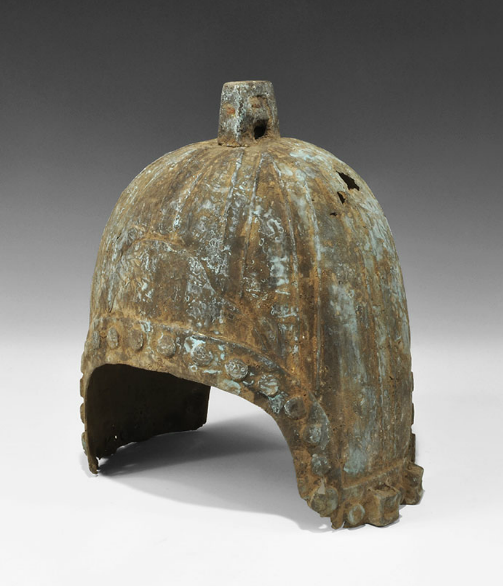 Despite the fact that most of the Chinese are familiar with the legacy of bronze plate helmets from as early as the Shang Dynasty (1600BC-1040BC) One explanation was that due to the fact that the Han engaged in an endless struggle mainly with steppe nomads who wore little to no armor, as such most of the combat would be of skirmishing nature~ thus most of the incoming harm would come from arrows rather than blows of halberds and spears as it was in the ages before. 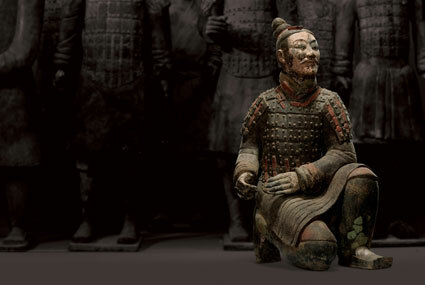 This is not to say that China was unfamiliar with heavy armor or heavy helmets~ in fact, during the Warring States period and the high point of the Qin conquest, the charioteers who fought on the war chariots often wore extremely heavy armor for the period. 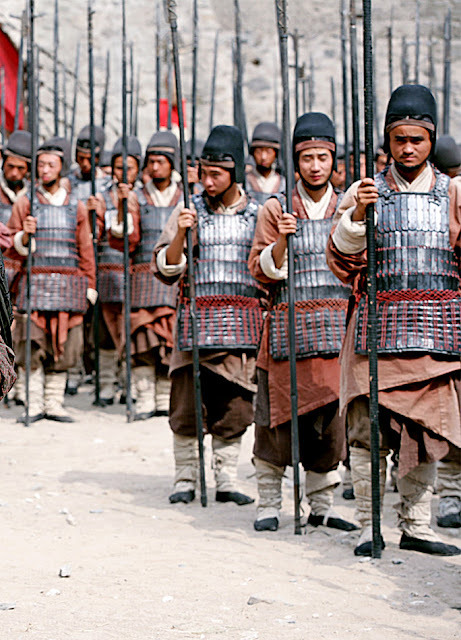 Because most of the Han battles required charging and counter charging mobile steppe foes~ during the early periods many of the soldiers appears to be lighter armored than the Han predosessors. The context of the conflect is explored here. 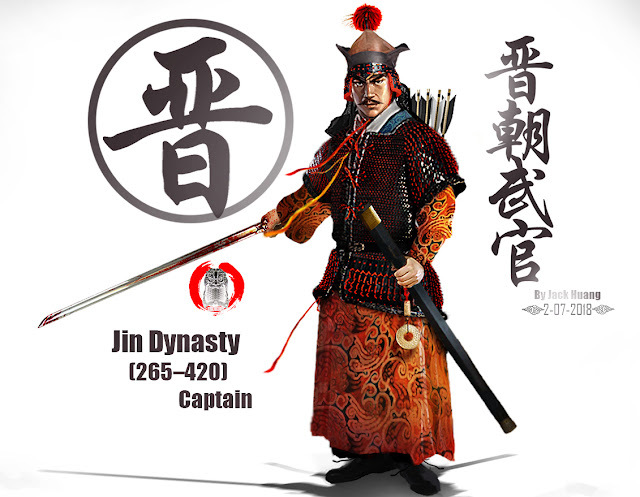 After the fall of the Qin dynasty in 207 BC came the rise of the Han dynasty in 202 BC. 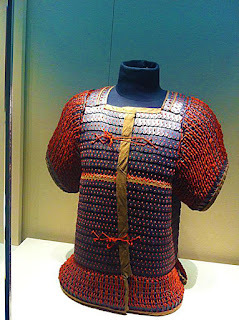 During the Han dynasty, new style of armour such as scale corselet made of leather and/or iron were adopted. 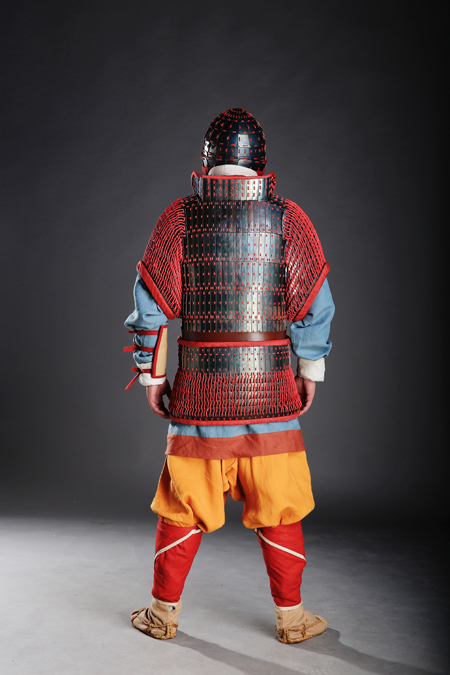 During this time period, the primary metal used in armour was iron, and occasionally steel. Early Han soldiers would have used armour and weapons produced during the Qin era. 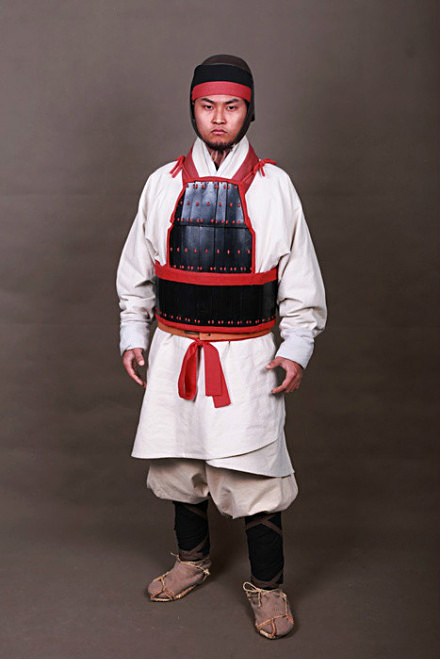 The Han army had armour standardized to meet the need. 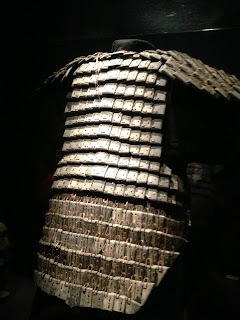 Armour used by the Han included coats of plates; 两当铠 (liang-tang, or "double-faced" armour); and lamellar cuirases made of metal or leather that was suspended over the shoulders by cords. 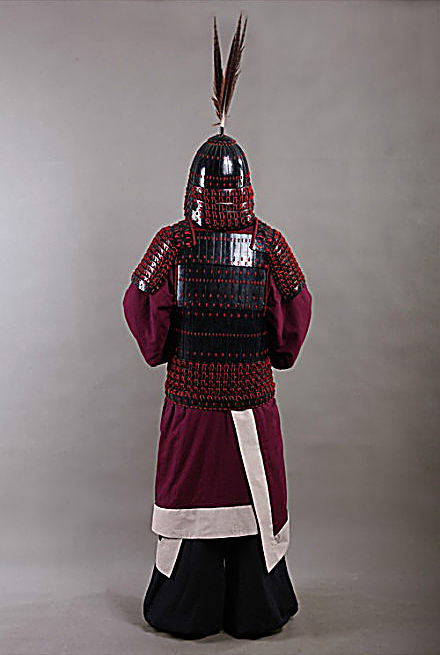 This armour was used by both the infantry and the cavalry. A much heavier and more expensive version, consisting of metal plates laced together, was worn by officers. 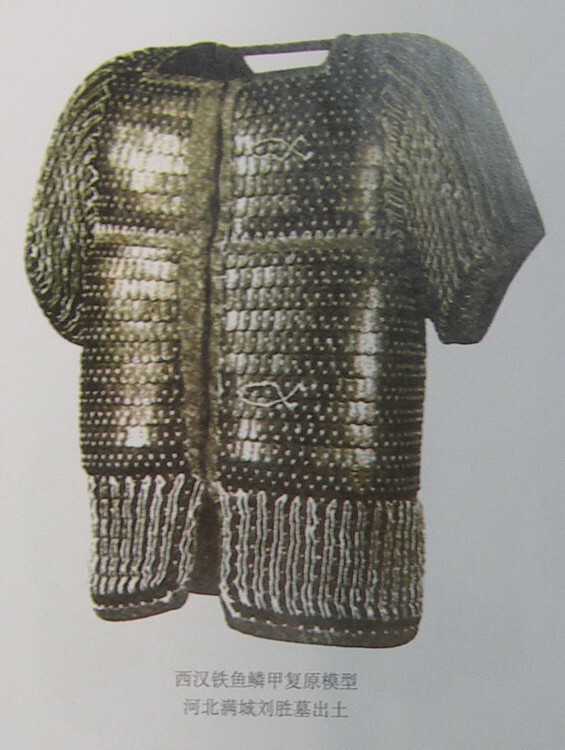 Western Han "Fish scale" armor, compared with the scale armor of the Dark Ages in Europe, these possessed more flexible pauldrons, Also~ because of the small and intricate overlay of the scales (when compared with the large, finger lengthed scales of the Dark Age armies,) it can well stand jabs and stabs directed from below and protect the wearer's armpits (a common trick when fighting opponents with scale armor is to jab from below where the scales offer no protection) ~ which makes these armor excellent for cavalry. 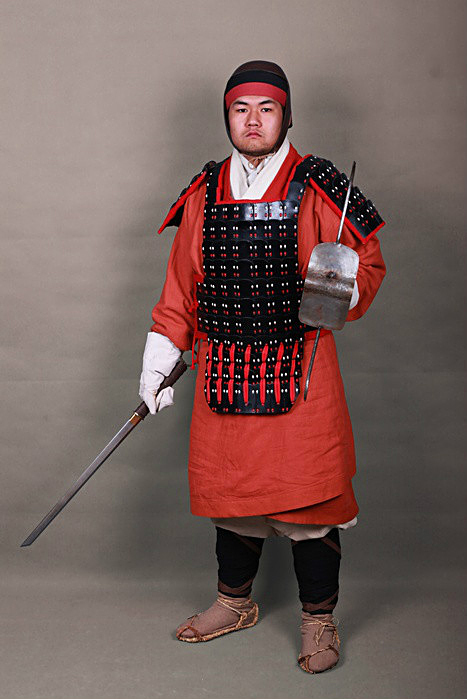 Shields were used by both infantry and cavalry. 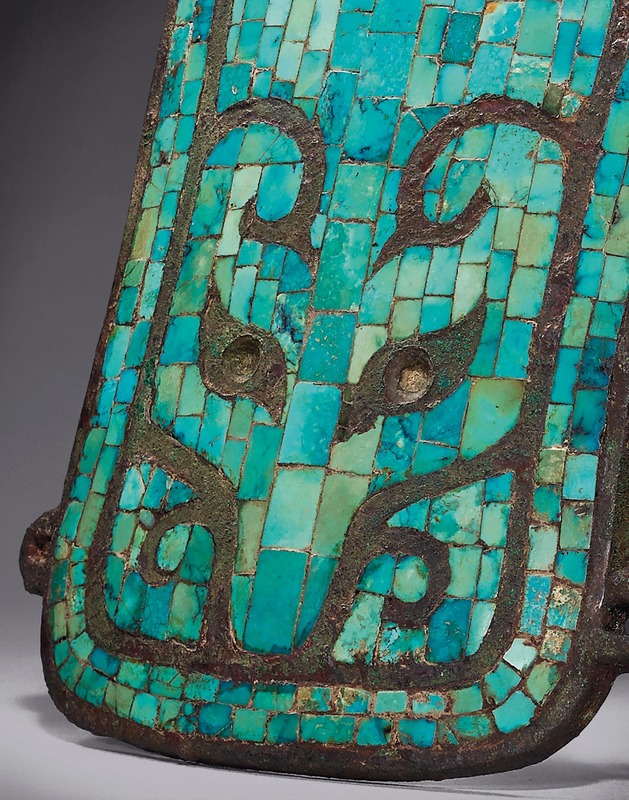 These shields were usually made of wood and often reinforced by a metal centre and rim. 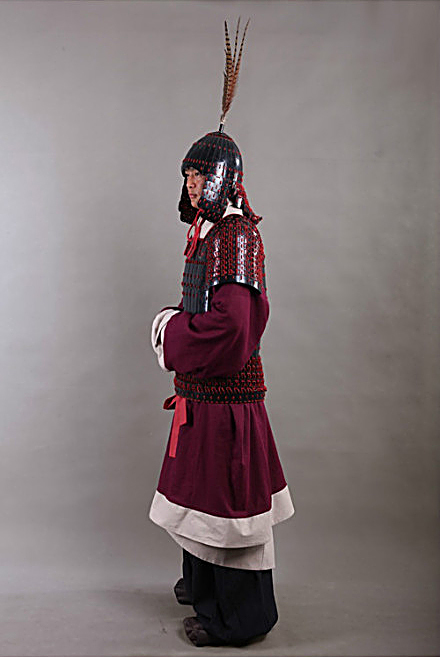 As for cavalry, during much of the Warring States period, most light cavalry units served as skirmishers - thus armour for cavalry was rare, as it was not seen as necessary. 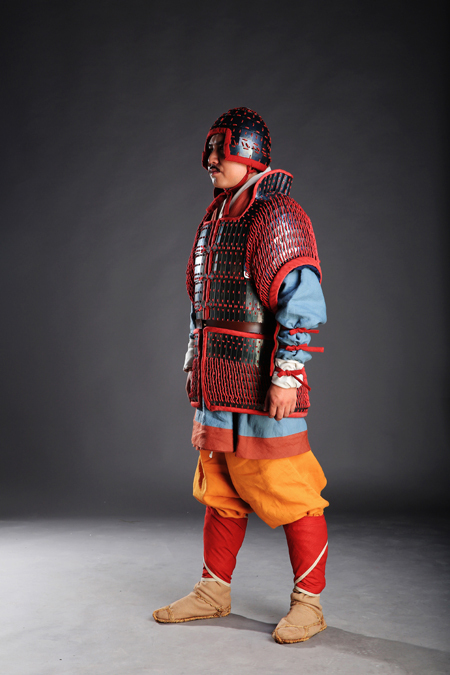 Armour for heavier cavalry tended to be lighter than that of the infantry. 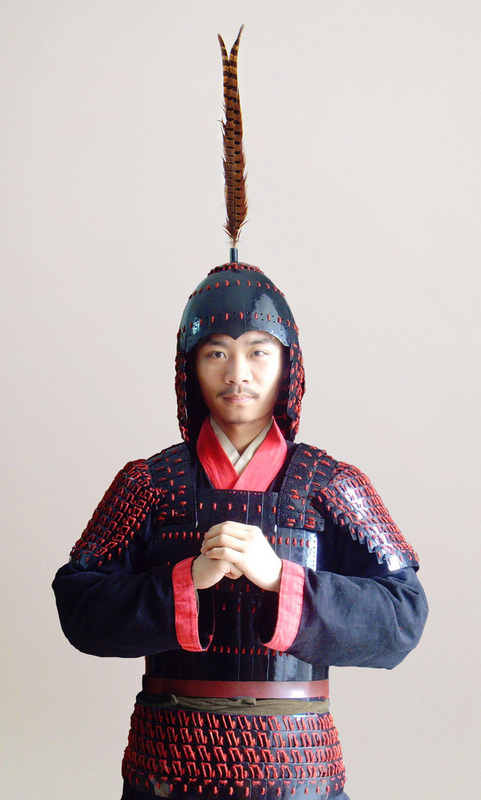 But due to the heavy Han entanglement with steppe invaders, true cavalry, ~ and by extension true cavalry armor began to appear around 160 BC. Light Early Western Han auxiliary/ Levy with simple lamellar armor and steel short sword, most would either be equipped with a sword or a shield configuration, or armed with a Ji- dagger halberd, some would be armed with light crossbows for massed volley fire. 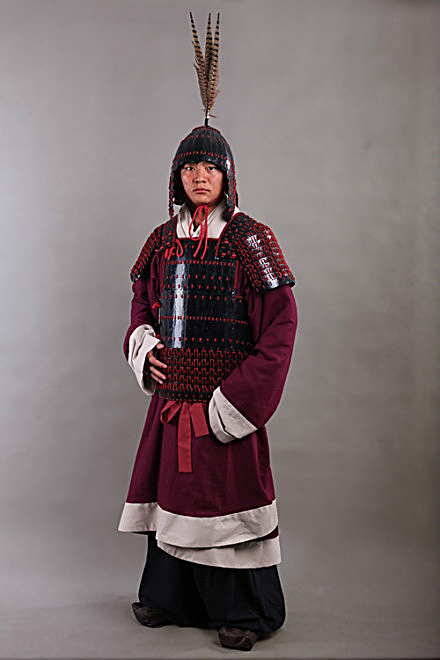 Many of these troops served as guards and soldier- farmers along the forts of the Great Wall to provide a constant guard force against the eternally migrating Steppe hordes, they would man the forts and spend the years stocking the forts with extensive grain supplies for the exhaustive Han campaigns into the Tarim Basin. 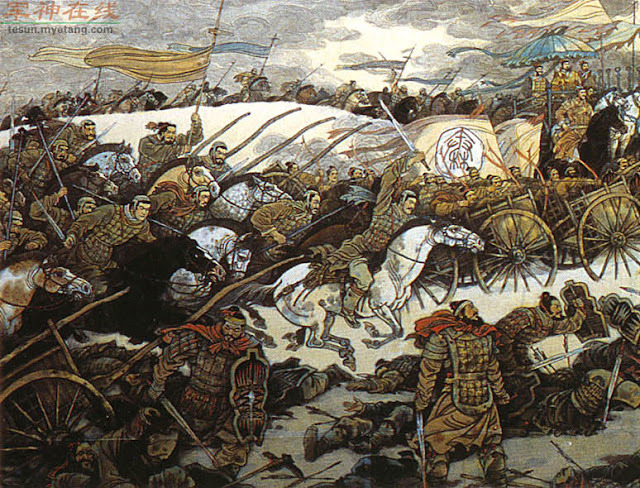 Early Western Han troopers. 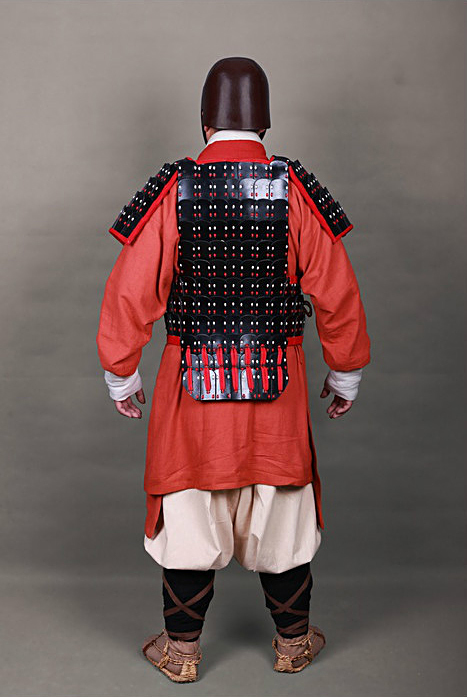 These professional troops would be properly armored with either scale armor or lamellar armor where multiple plates, or rows of plates protected the wearer's torso. 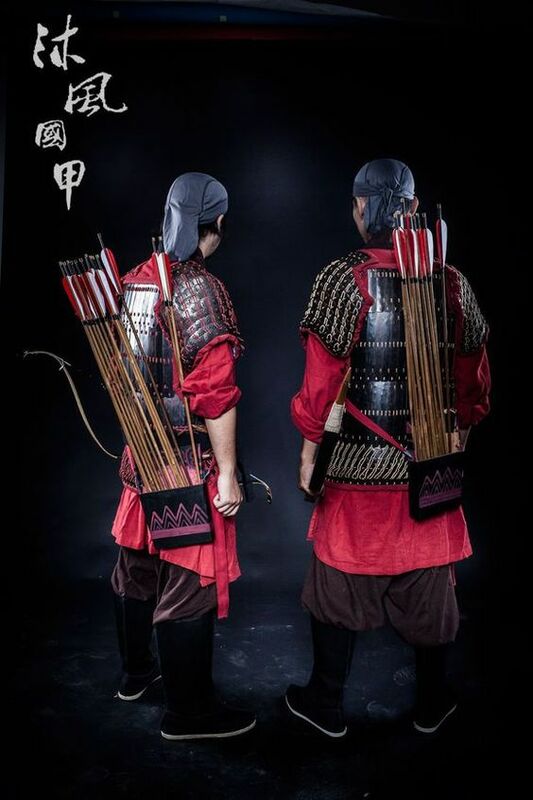 These trooper are usually equiped with a lacquered shield with an iron rib (and sometimes a bow shaped sword catchers as shown^ above) and like the lighter levies, they would either be equipped with a shield and long sword made of either iron or steel, a ji- dagger halberd, or a crossbow, later troopers would be equipped with two handed blades of iron or steel. 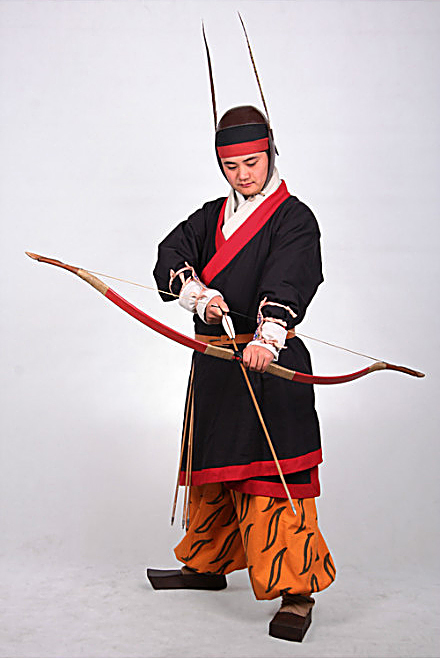 Melee infantry and archers would both look like this, though archers are usually lighter armored. During the Han, blocks of these troopers are trained to fight in conjuncture to support the newly created Han cavalry wings~ in a pinned fight against the steppe hordes, they would usually provide cover fire before the cavalry engaged or when their cavalry retreats behind their lines. 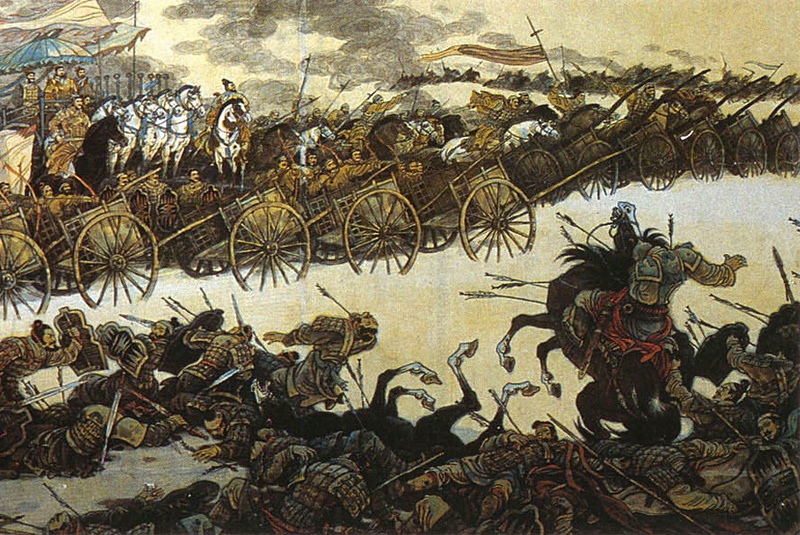 The ways of counter- steppe warfare the Han developed would be used all the way until the Ming and Qing dynasties only 300 years ago from today. 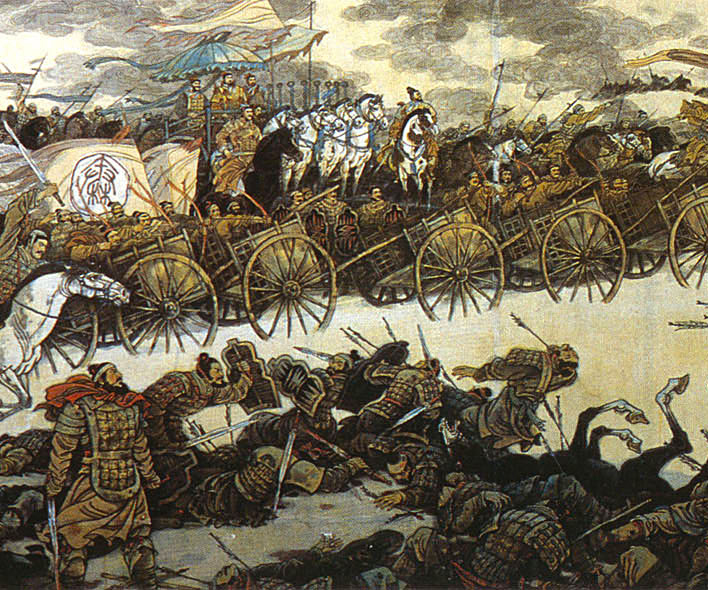 Like the Battle of ChangPing here~ where the Qin army created a giant wagon fort- the Han would utilize laggers to bombard the encircling horse archers with massed crossbow bolts until they are too bloodied to continue fighting. Experimental reconstruction of an Elite archer. Very likely to be mounted. 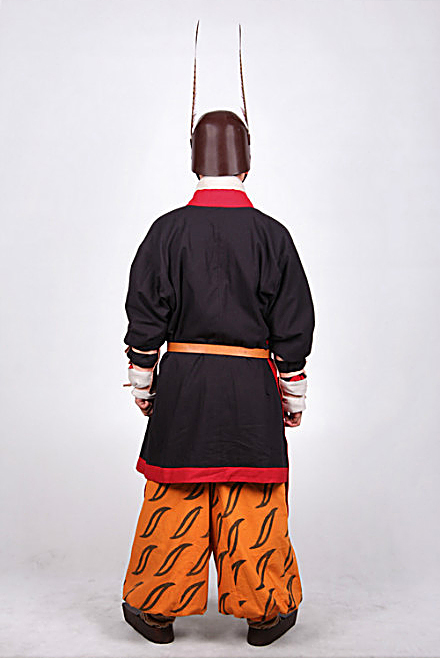 The bracers and the tiger stripe pant are mix-and-matched from actual archaeological finds. 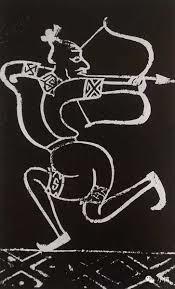 Though paintings existed of these archers, their roles are still largely unexplored. 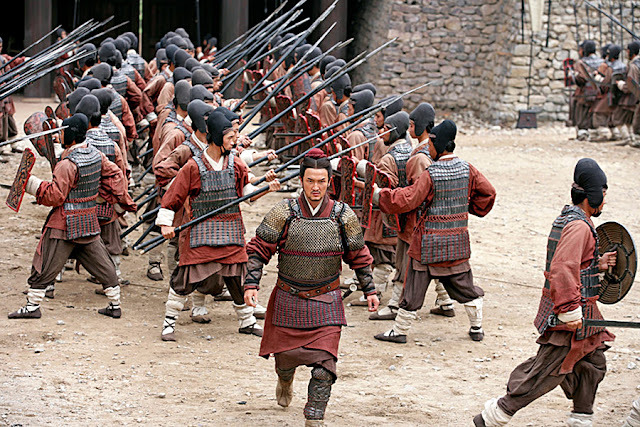 They are likely elite auxiliaries~ or royal hostages fighting on the side of the Han against the steppe hordes. 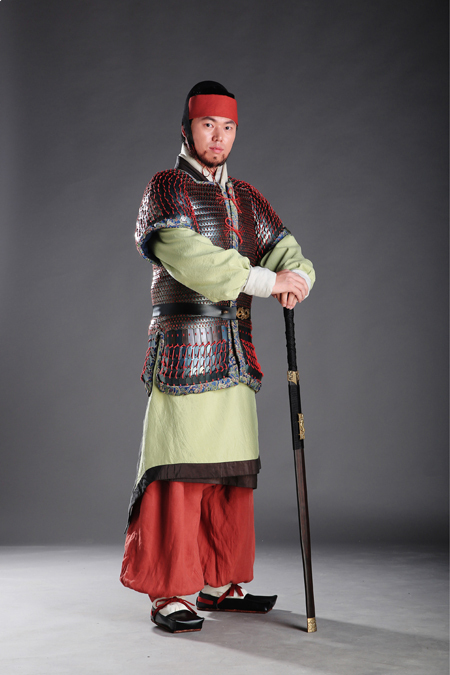 Middle Han (1st Century BC- 1st Century CE) heavy trooper from the time of Emperor Wu's expedition against the Xiongnu Confederation. 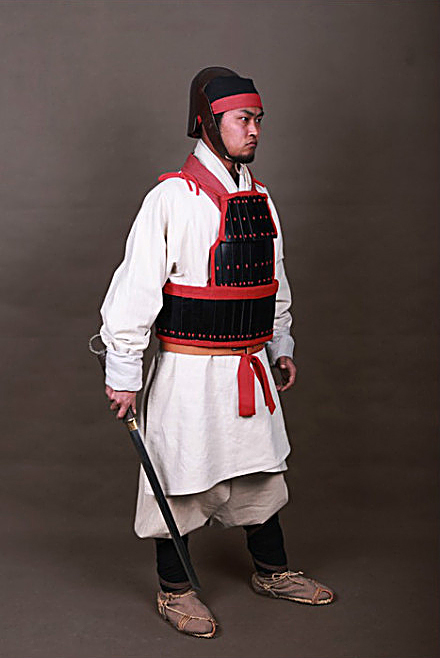 By the Asian standard of the time~ and the standard of much of the Classical history these soldiers are extremely heavily armored. 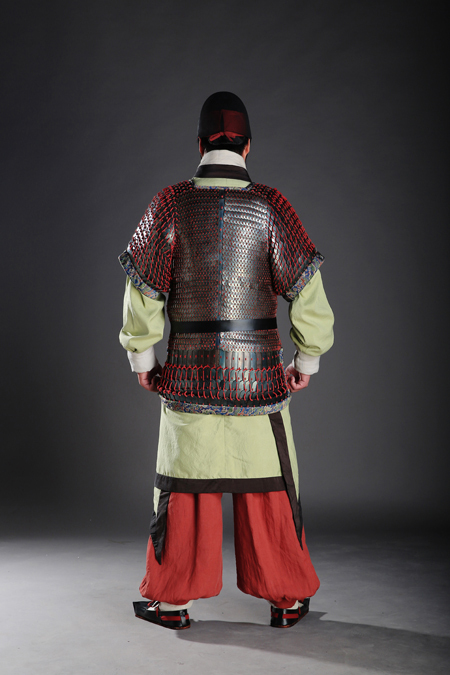 They wore Also, the Tong Xiu Kai (筒袖鎧), lamellar armour that has complete tube-like sleeve so to not expose the vulnerable armpit (a common weakness found on almost all lamellar armour) ~ which suggests that they might be cavalry- borne. 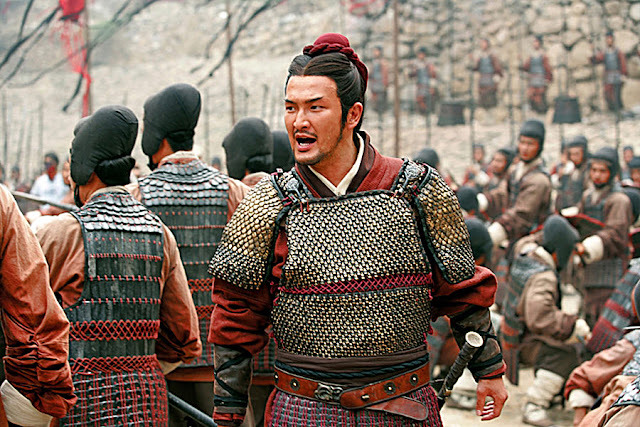 The fact that these troopers has bracers on their arm shows that they are likely archers, though most of the Han army would have been trained in archery. 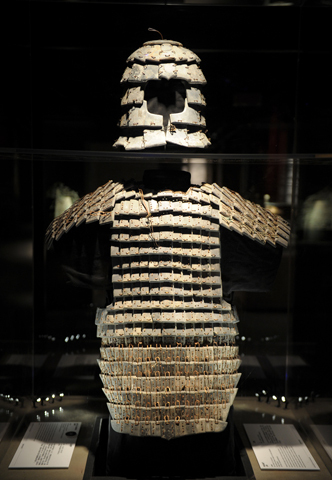 The very heavy iron pot helm worn by Han troopers. 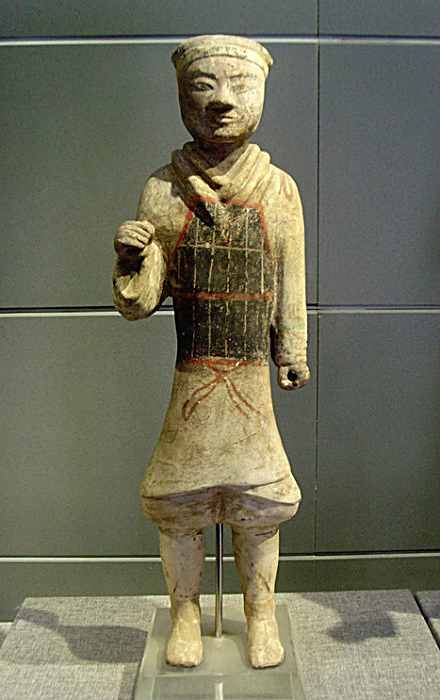 Early Han dynasty. 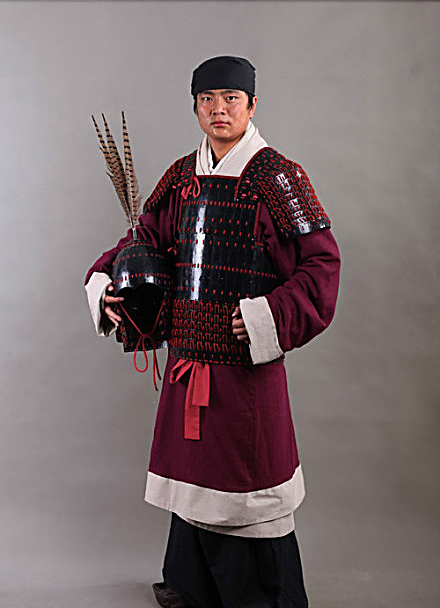 Early Western Han, armoured officer with elaborate lamellar armor and a scale helmet with pheasant feathers. 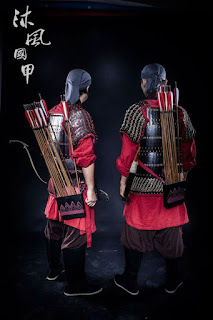 Early on, officers like these would have commanded the battlefield riding from their command chariots, later, when true cavalry was developed and implemented they would send out heralds and sometimes construct viewing platforms to conduct the battle~ though in those battles the opponents are usually Chinese rebels. 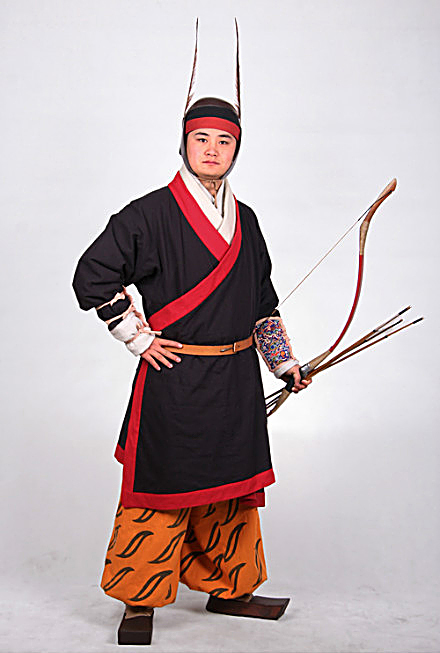 In the steppe wars against the Xiongnu, these officers would have had a large contingent of bodyguard cavalry. 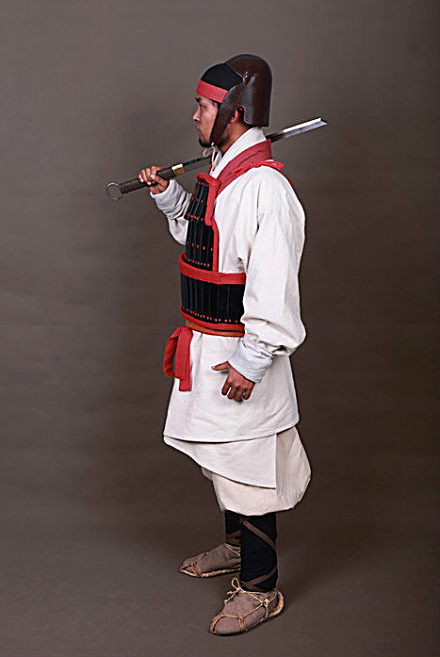 Aside from a bow, which nearly all the generals carried, they would also be fitted with a long sword and sometimes even a two handed steel sword. 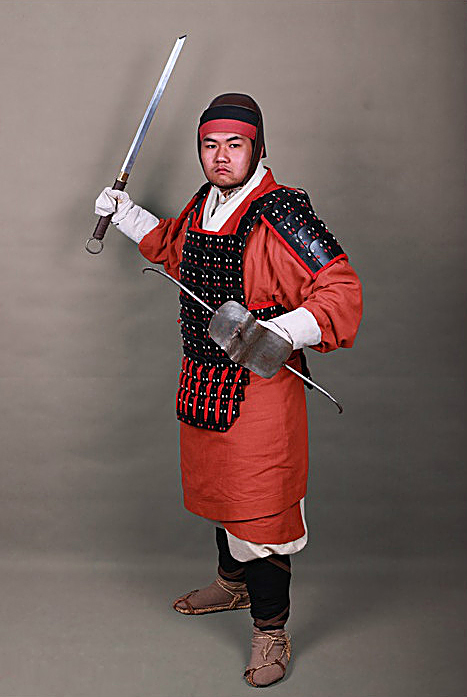 By 1st Century AD the swords would be made with blast furnace steel. 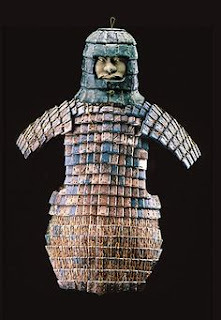 After the Han dynasty Chinese armor in general would become bulkier and bulkier in each successive generation until they would have nearly full coverage of their body parts. By the Tang and the Liao and Jin dynasties, there would be whole Armies of cataphracts where man and horse~ except the rider's hands and face would be completely covered by lamellar plates. 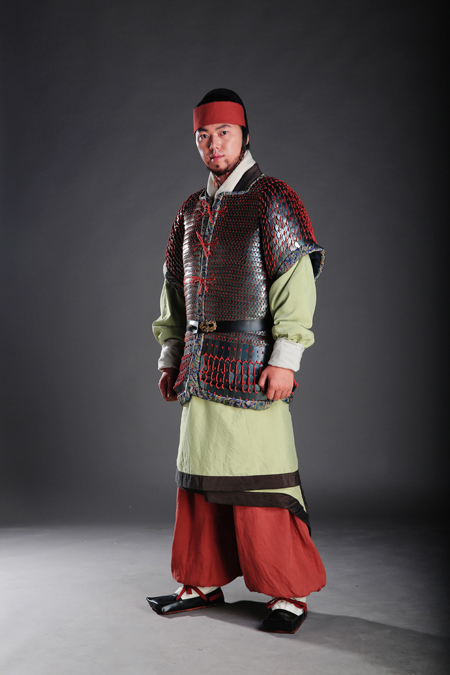 A Jin dynasty (265-420) infantry captain, he wears a blackened fishscale armor with flexible sleeves. But unlike his cavalry counter parts, does not wear extended armored collars to protect his neck, nor have long draping scale faulds to protect his legs. 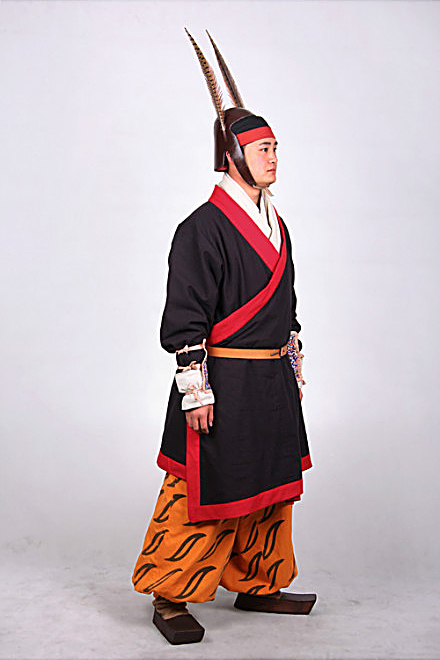 In stead he opts to wear long trousers (robe) for greater mobility. 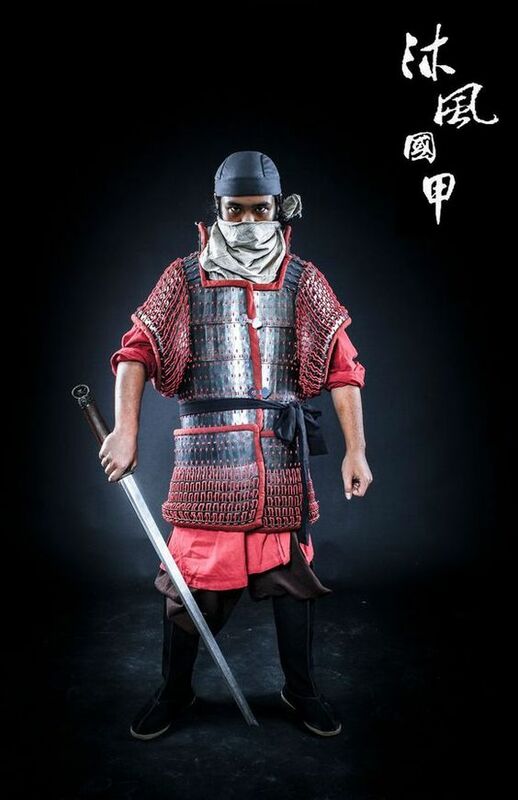 To compensate for his diminished protection, he is equipped with a long two handed steel sword. 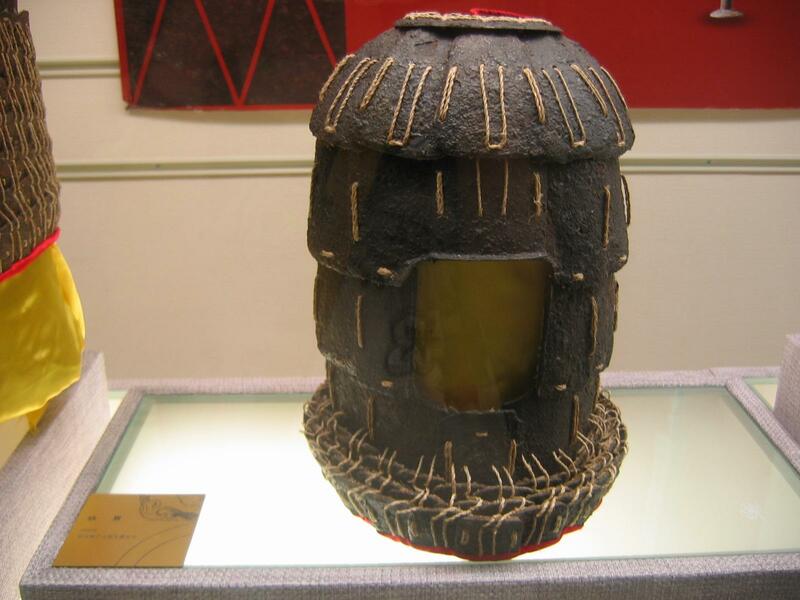 Which by the late Han period would have been treated with blast furnace. The length of these swords varies from shoulder height to the length of a short spear. 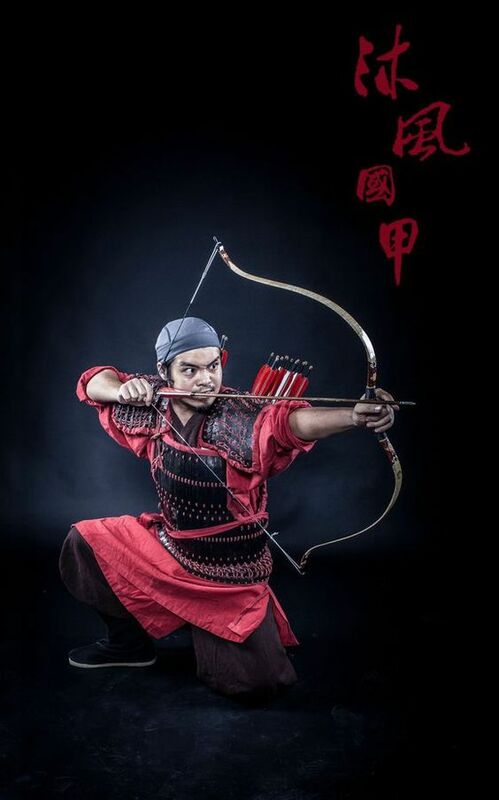 He is also equipped with a recurve composite bow and a quiver. 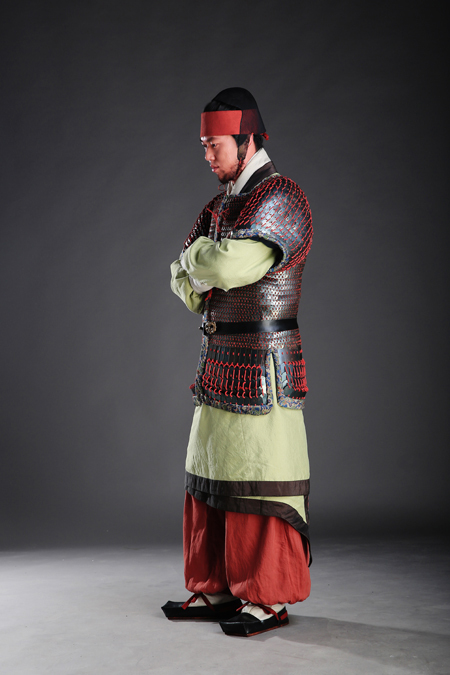 Qin charioter armour has complete sleeves that cover entire arms and hands. 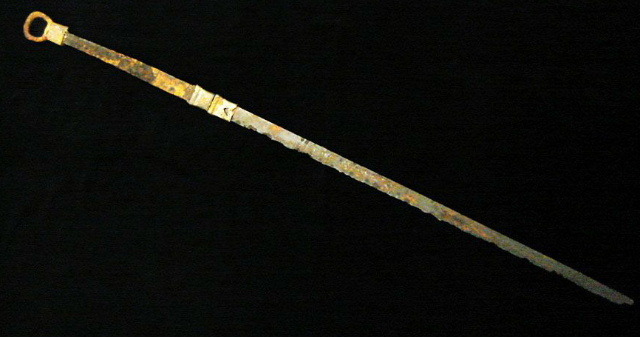 By Han period Ji halberd (that can thrust) largely replaced Ge dagger-axe. 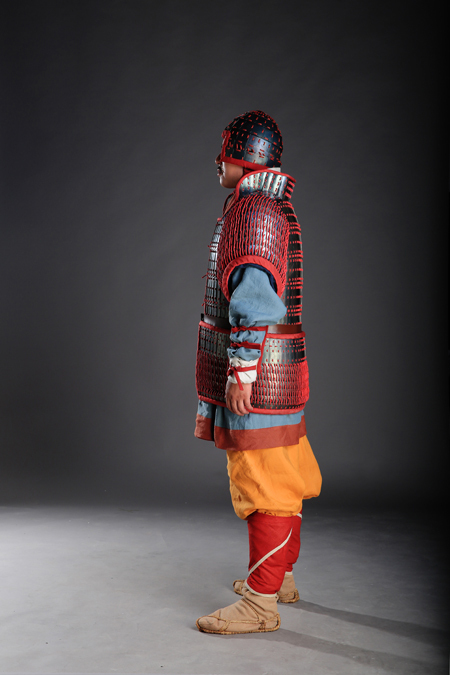 Chinese did not use scale armour for much of its history. 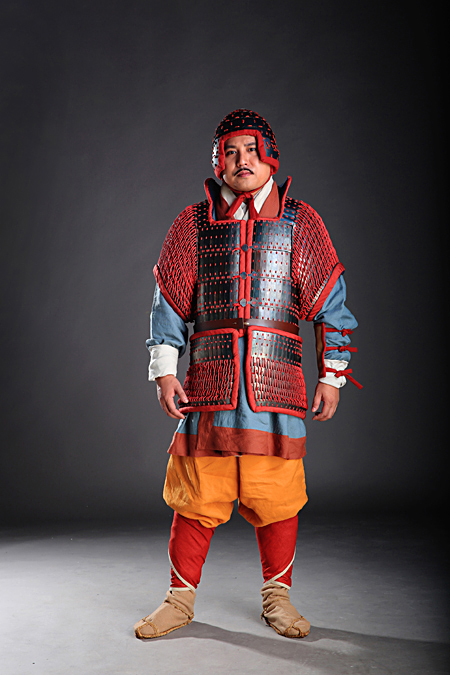 Yu Lin Kai (魚鱗鎧) and the likes are lamellar armours by modern definition, just with metal plates shaped like fish scales. OTOH, I don't really understand where this notion of "coat of plates" comes from. They are all lamellar. 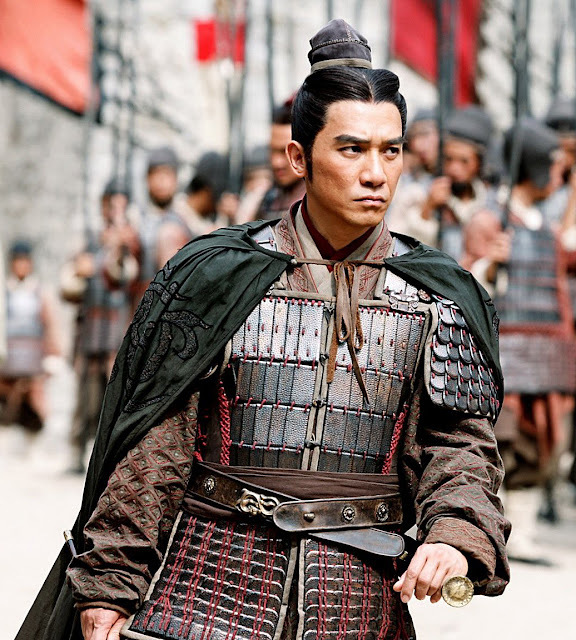 Also, while it also depend on one's definition of what "heavy armour" means, Tong Xiu Kai is good enough an armour that it can be considered heavy by anyone's standard, no just Asia. It provides more coverage (i.e. 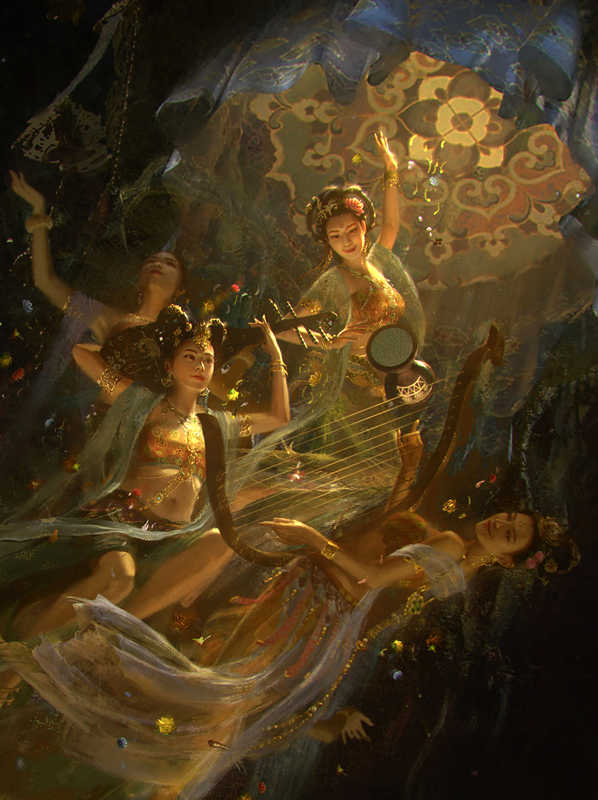 neck) and less weak spots than say, Roman segmentata. However Han probably did not field these in large number. 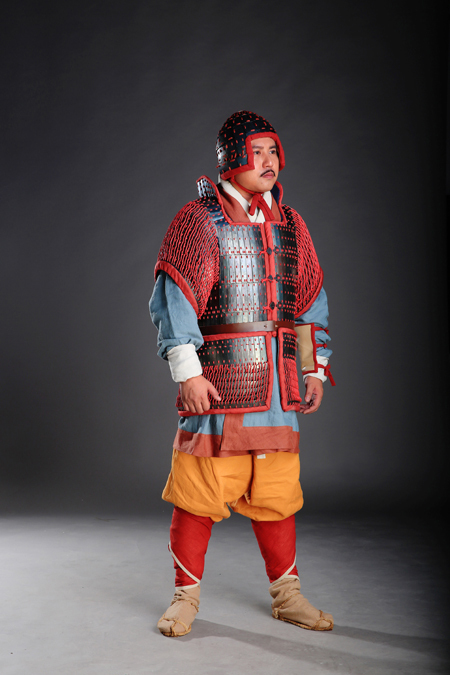 Do you know the average weight of a Han scale armour? More precisely, how much metal was used in their confection? 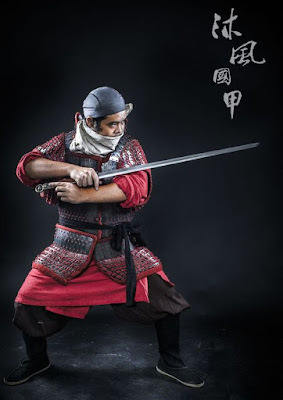 The Han Levy infantry reenactor is holding a buckler with 2 steel rods extending above and below. What is it and what is the historical documentation of it? It is a sword catcher, usually made in the shape of a recurved bow, except they are metallic hooks, they function like a combination of a buckler, as well as a parrying hook. They seem to be exculsive to the Han and the Era of Fragmentation, by the Sui and the Tang periods they were practically gone. 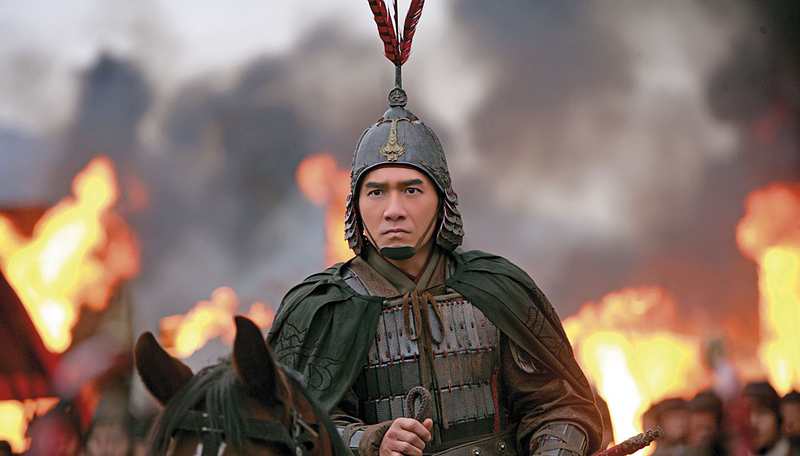 I know this article has been shared on some forums in regards to accurate Han armor and whether CA's latest Three Kingdoms Total War series had it wrong by featuring soldiers with poofball on the helmets. 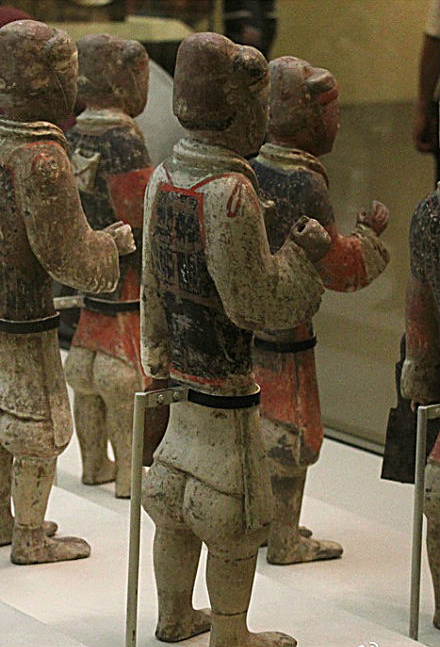 Well, I should actually point out (and I believe it has already been posted) that later Eastern Han, Jin, and Northern Dynasty soldiers did indeed had a poofball ontop of their helmets. 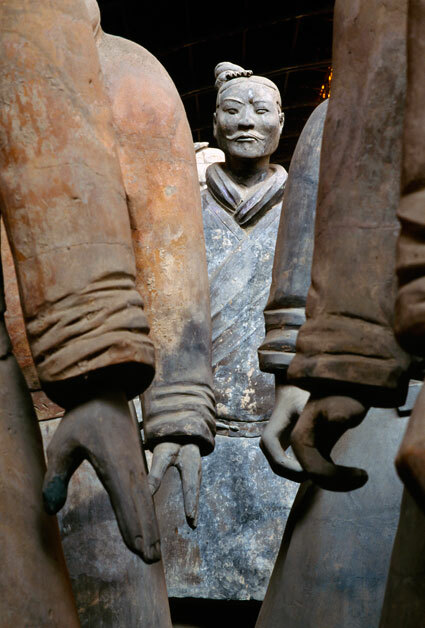 It could be seen in both clay pottery and figurines. 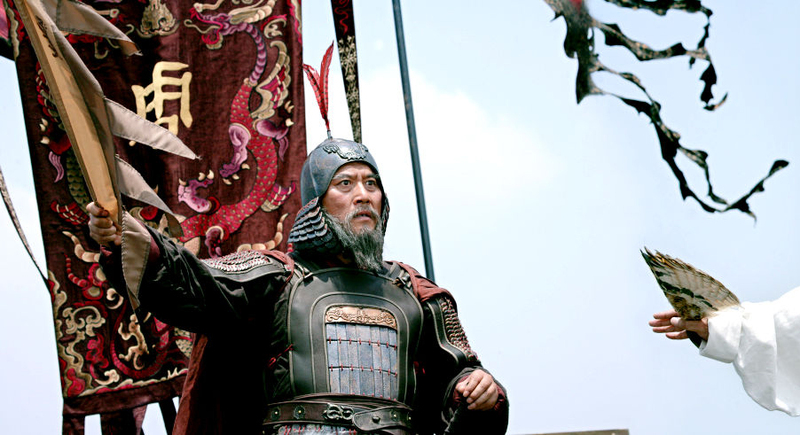 Was the Western Han leather cap still in use by the Three kingdoms Period-Jin Dynasty and to some extant NS Dynasties or was is already being replaced by metal helmets?